Wondering what your kid is doing at the moment back there at home, while you are away – at work, in business trip, out shopping?.. These situations, when you have to leave your child alone or with someone and can’t help worrying, are almost inevitable. But you can get rid of doubts and uncertainty and keep an eye on your child even not being physically near. A simple DIY parental control and children safety system based on video surveillance software for computer, mobile devices and tablets, will help you know anytime, anywhere if your child’s safe and sound, what he or she is doing and if they have eaten their breakfast today. It’s easy to do. A couple of IP cameras mounted on the wall, or invisible cameras hidden in alarm clock, masked as speakers, etc. 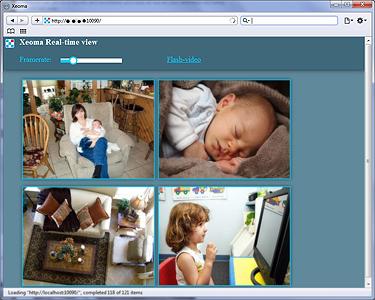 and any desktop or mobile computer with Xeoma Video Surveillance Software running on it and – voila! – you have the perfect parental control tool to keep tabs on babysitter, provide PC screen monitoring, and control the situation on the whole, however distant geographically you may be. Check your cameras from any mobile devices, at work or on the go, via web browser. 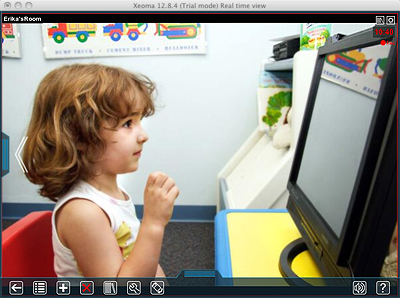 Xeoma is good also for PC screen monitoring for parental control over your child’s activity on computer. Motion-activated screen captures will let you see if your child is watching movies instead of doing homework again or is studying hard. IP video surveillance manufacturers and installers have recently pointed out that even those who buy video surveillance software and other solutions primarily for security uses, later on use it just to check on if everything is alright and watch their babies sound asleep. We understand that you care about your children and that’s why we made Xeoma easy, intuitive and comfortable to use. Your child’s safety is our priority!